Back For A Third Year! Music Weekends is back for a third year to carry you through the post-holiday stretch. Mixing languid, relaxing afternoons with foot stomping, hip wiggling ones, Music Weekends is a 10 week series taking place every Saturday and Sunday afternoon from January 5th to March 10th. All downtown, all organized by local promoters, and all great quality. We’ve even thrown in an extra special one for the kids at The Making Box on Family Day. Thanks to Celebrate Ontario and Hillside, the series is extra special in 2019. You can enjoy an added arts element at every performance such as live art, spoken word, dance instruction, singalongs….a mixed bag of goodies awaits the audience at each venue. Launched in 2017, the series brings together local promoters and is aimed at music lovers who can’t always stay up late enough to enjoy Guelph’s lively late night music scene. Music Weekends welcomes people of all ages who want to sing with their friends, dance with their children, and still be home in time for supper. These events are all ‘Pay What You Can’, and all monies collected go directly back into the local music industry. 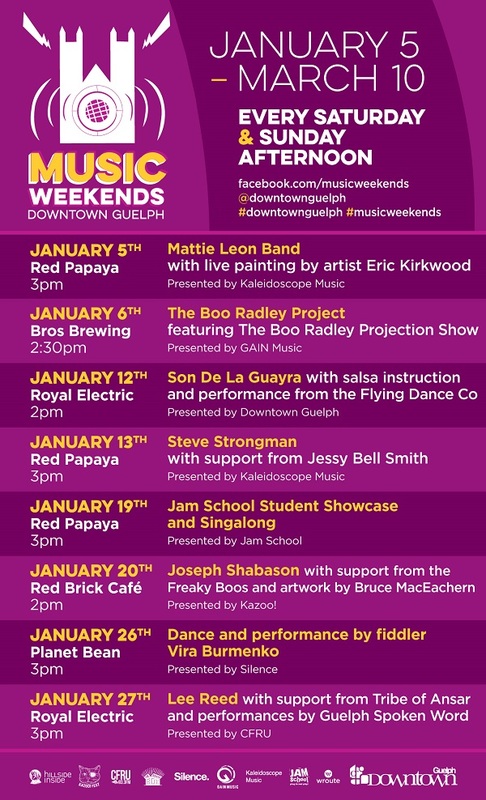 Check the schedule for January and keep updated at www.facebook.com/MusicWeekends.